Infuse awe into your life. Manifest your desires. 1. a mixed feeling of respect, fear, and wonder, caused by something majestic, sublime, sacred, etc. Reconnect with Your Wild Divine Self as You Embrace a Force of Nature! Sss… I am Serpentessa, a snake priestess, a.k.a. 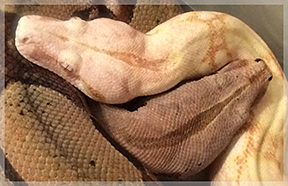 an inter-species facilitator with a specialty in Boa Constrictors. What I know: Life offers no guarantees, but lots of lessons, transformation and adventures. 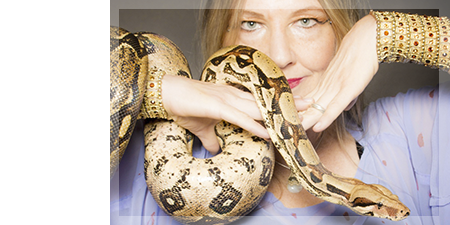 What I do: With my Snake teachers, I impact people by igniting awe and mystery in their lives. You get present, evolve your power and embody deep bliss. My pledge to You: Your reactions, choices and responses are always respected. Choose to go from “Whoa…. to WOW!” Become Present, embrace Power & embody Pleasure. Corresponding one-on-one services available. Exhilarating & unforgettable! Awe-striking snake encounters unlock the secrets of instinctual presence, empowering you to navigate emotional challenges in the midst of our chaotic modern world. Throw yourself into a realm of wonder and mystery. Theatrical performances showcasing the awe- inspiring power of the snake for events, parties, team retreats, conferences, and more. Embark on a thrilling adventure into sensory bliss! Learn to trust your intuition to find the opportunities in adversity. Embody mindfulness, abundance, renewal through resonant, personal connection with snakes. Ready to Grow? EMBRACE THE IMPOSSIBLE to manifest your Desires. • For Snake Massage, ENTER HERE! Learn why you react the way you do with this Free Gift!